Prince George, B.C. 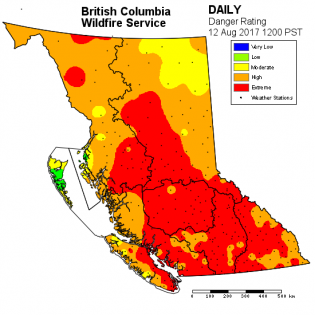 – Changes in weather conditions, particularly the possibility of strengthening wind speeds and lightning strikes, are posing what officials are calling a “dynamic” threat to fire-ravaged B.C. this weekend. B.C. Wildfire Service spokesperson Ryan Turcotte in Kamloops says there are currently 140 wildfires burning in the province, an increase of 9 from Friday. Since the start of the fire season on April 1st there have been 975 wildfires which have burned 651,000 hectares, an area double the size of Greater Vancouver, including the North Shore mountains and Fraser Valley out to Aldergrove and Maple Ridge. This is the second highest number of hectares burned in a season since 1950 when 855,000 hectares went up in flames. The cost of fighting this year’s fires is $277.7 million and the are slightly more than 3,900 firefighters and other personnel fighting the fires. That includes 647 out-of-province personnel and 1,600 contractors. There are 233 aircraft involved at this time. Turcotte says while rain is forecast for the BC coast today the interior will get only scattered showers starting late tonight. Increased instability in the interior will bring gusty winds up to 60 kilometres per hour and the potential for lightning. Coastal showers should move inland to the south and central interior on Sunday and there could also be isolated thundershowers. Cooler temperatures should also arrive on Sunday and run through Monday but Turcotte says “we are expecting to see a drying trend as any precipitation moves over into Alberta.” The forecast is for a return to mainly sunny skies and seasonal temperatures by mid-week. The largest fire in the province, the Elephant Hill fire which has threatened places like Loon Lake, Clinton and 70 Mile, covers just over 124,843 hectares. Increased winds caused it to grow on Friday. There are currently 570 firefighters battling that fire along with 25 helicopters and 123 pieces of heavy equipment. Both the Thompson-Nicola and Cariboo Regional Districts have initiated evacuation orders and alerts for several areas around the Elephant Hill Fire. For anyone with relatives or friends who went to the Shambhala Music Festival in the Salmo area in the Kootenays this weekend, an evacuation alert was issued there following the outbreak of a fire which covers 250 hectares. Wildfire personnel along with two helicopters and heavy equipment are assigned to that fire. Both provincial Emergency Management and Transportation Ministry officials say that situation is being monitored closely and contingency plans are in place to safely move the approximately 15,000 people and 2,000 staff safely from the site at the Salmo River Ranch near Nelson should that become necessary. The festival is to run through Sunday. You can report a wildfire or an open burning violation to *5555 on a cell phone or 1-800-663-5555.